Downbound the St. Marys River at the Soo, Aug. 3, 2008. One of very few vessels built for Great Lakes service by the Saint John Shipbuilding and Dry Dock Co., Saint John, NB, the Seaway sized gearless bulk carrier was built as the yard's hull #1084 and launched October 15, 1967 as the Senneville for the Mohawk Navigation Co., Ltd., Montreal, QC. Named after a community near Montreal, QC located on the western end of Montreal Island on the Lake of Two Mountains, home to Mohawk Navigation's president Mr. Robert A. Campbell, the Senneville became only the second Great Lakes bulk carrier with her wheelhouse, all accommodations and machinery aft. 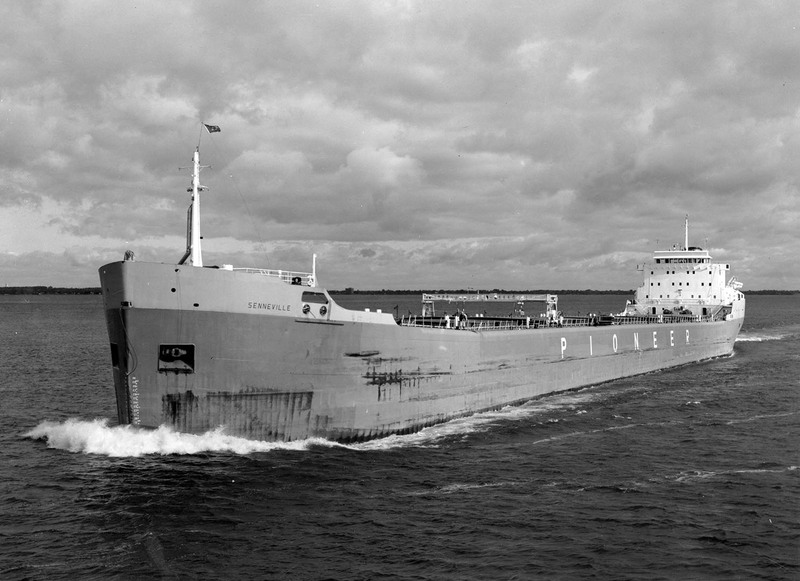 The first laker was the Senneville's 1963-built fleetmate Silver Isle (now sailing as the Algoisle). The Senneville was built using the lightest weight steel that would pass classification society and Coast Guard inspections to save weight and increase cargo capacity. Upon entering service, the Senneville became the flagship of the fleet and departed Sept Isles, QC on November 8, 1967 on her maiden voyage laden with iron ore for Cleveland, OH. 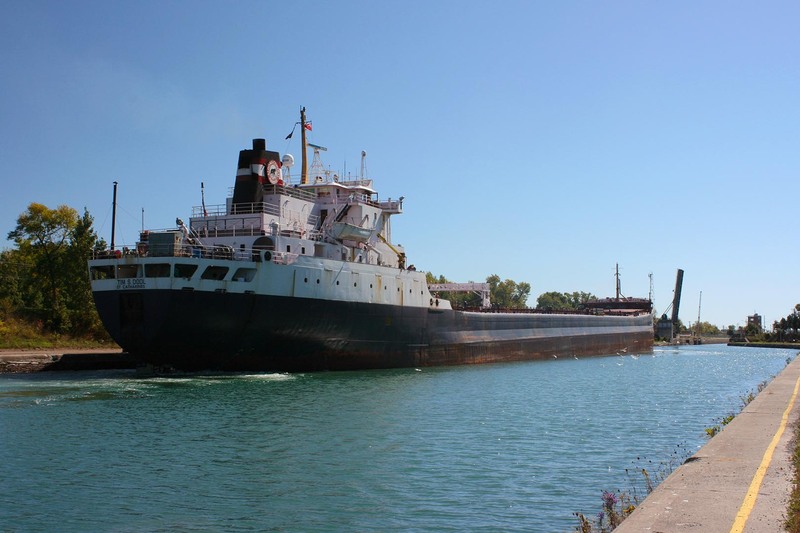 While on this trip, she was noted to have transited upbound in the Welland Canal on November 11. As originally built, the Senneville was the standard Seaway 75' 00" wide. She had a mid-summer cargo capacity of 28,200 tons at a draft of 27' 09" and a Seaway capacity of 26,100 tons at the old draft restriction of 26' 00". Her original power plant was a M.A.N. model K6Z78/155 single acting, two stroke cycle, 6 cylinder 9,900 b.h.p. diesel engine burning intermediate grade 180 fuel; the power being directed to a single controllable pitch propeller moving the laker at speeds up to 17.8 m.p.h. She is equipped with a controllable pitch 1,000 h.p. bow thruster. The Mohawk Navigation Co. operated in conjunction with and carried cargoes on behalf of James Richardson and Sons Ltd., Winnipeg, MB (a large Canadian grain handler). On September 19, 1969, it was announced that the Mohawk Navigation fleet consisting of the Senneville, Silver Isle and Golden Hind would be operated, managed and crewed by Scott Misener Steamships Ltd., St. Catharines, ON with the beginning of the 1970 season. Mohawk retained ownership while the bulkers were chartered to Scott Misener Steamships. 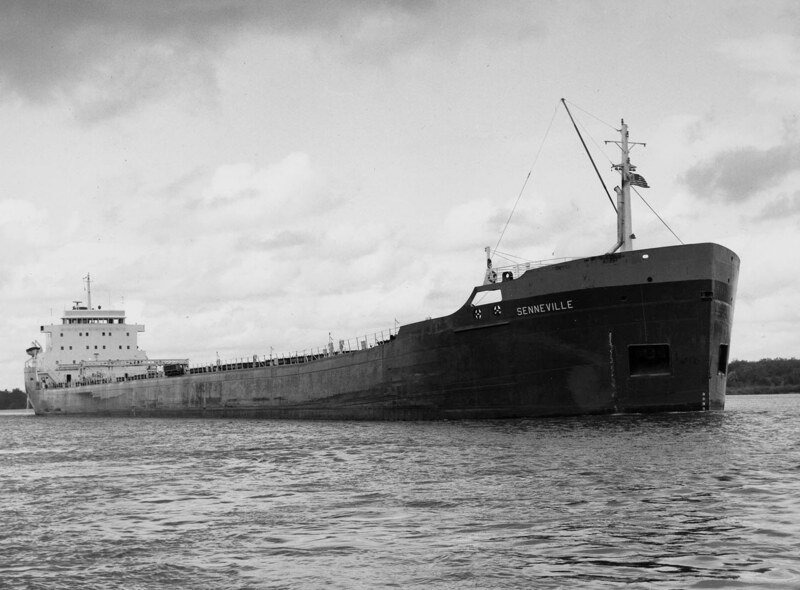 The Senneville distinguished herself on March 28, 1973 when she became the first vessel to pass downbound through the newly built Welland Canal bypass of the city of Welland Canal. Meanwhile, on the same day, Canada Steamship Lines' self-unloader J. W. McGiffin was the celebrated vessel as the first official upbound vessel at the Welland Canal's "Top Hat" ceremony at Lock 3 opening the canal for the 1973 season. 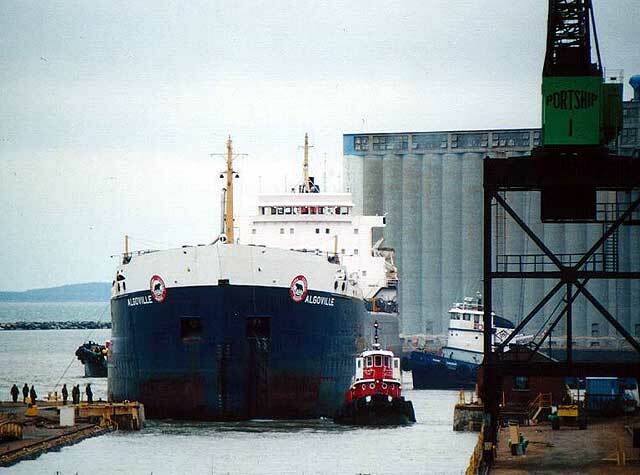 Then on October 4, 1975, the Senneville set a Great Lakes and Seaway rye record carrying 1,026,983 bushels from Thunder Bay, ON to Sorel, QC. This record still stands today. 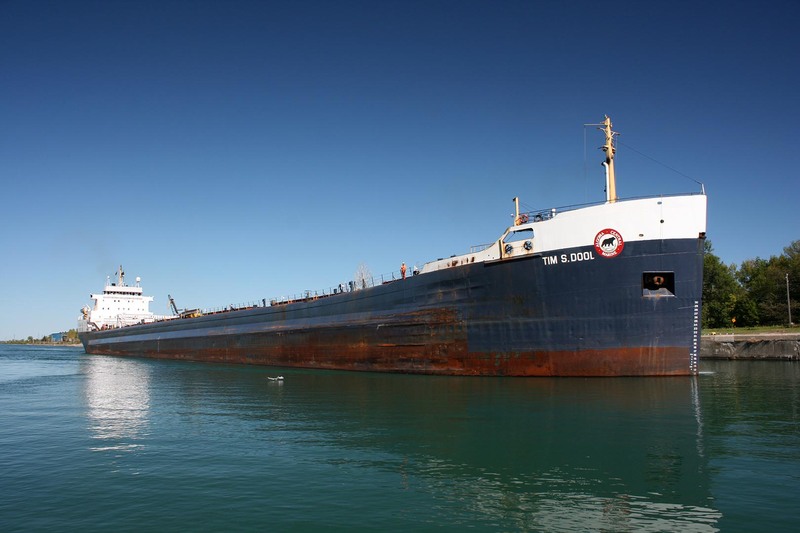 October 1, 1977 saw the vessel setting a Great Lakes soybean record when she carried 947,000 bushels from Superior, WI to Sorel, a record which was broken 2 years later. 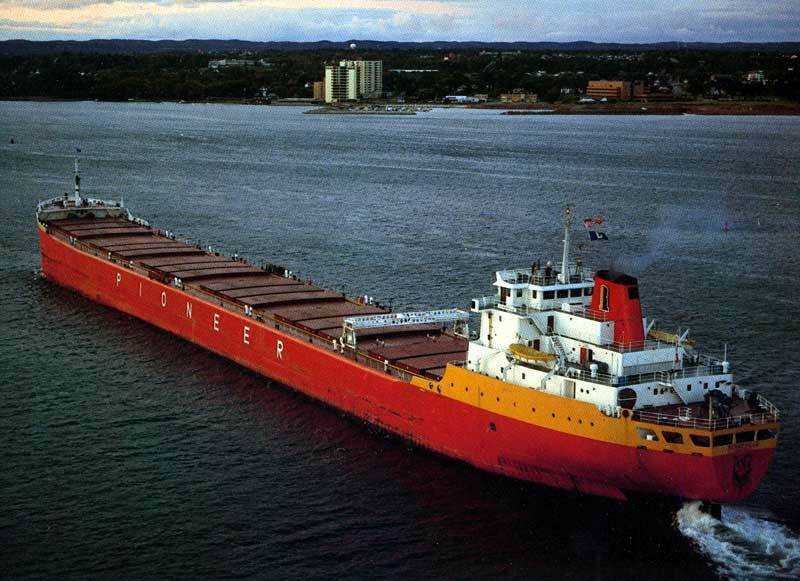 From 1991 to 1994, the Senneville and her fleetmate were operated by Great Lakes Bulk Carriers, Inc., St. Catharines, ON, a consortium consisting of the bulker fleets of Canada Steamship Lines, Misener Holdings and Pioneer Shipping, though still being managed by Misener. During the 1991/92 winter lay up, the Senneville had double bottom steel work completed and her # 1 hold was rebuilt as a tank to carry canola oil when not being used for dry bulk cargo. 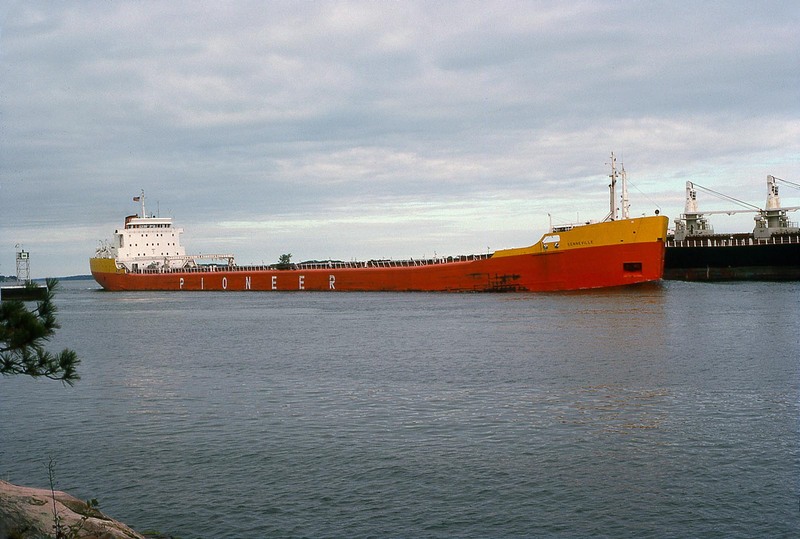 Early in 1980, the Senneville with her fleetmate Silver Isle were acquired by the newly formed Pioneer Shipping Ltd., an affiliate of Pioneer Grain Co. and a subsidiary of James Richardson and Sons Ltd., Winnipeg, MB. Misener continued to operate and manage the small fleet. The bulkers' hulls were painted the distinctive fleet colors of orange/red hulls with large white "PIONEER" on each side, yellow forecastles, white cabins and orange/red stacks with black caps and styled "JR" lettering on each side. The Senneville had very few incidents recorded against her name. On July 3, 1973, a power failure caused the vessel to strike a pier in Montreal resulting in bow damage. The laker grounded on October 3, 1977 while leaving Thunder Bay, ON with a load of grain. She was freed the next day after lightering some of her cargo; the resulting damage being a minor crack in one of the ballast tanks. 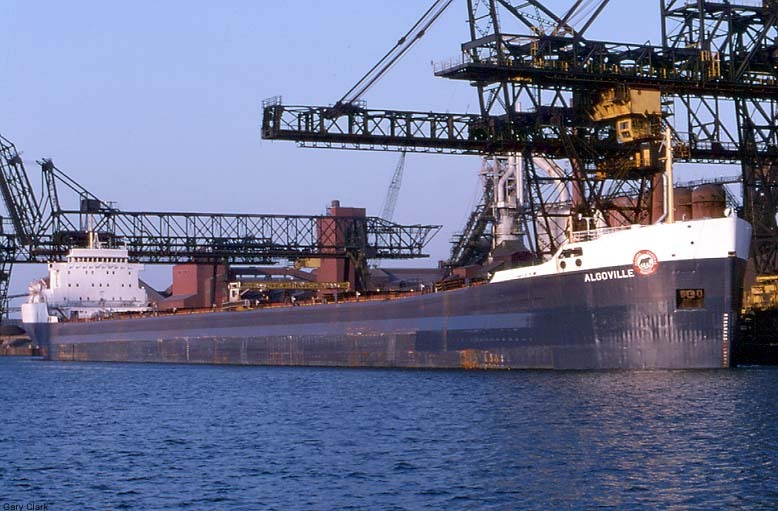 April 8, 1994 marked the closure of a deal whereby Algoma Central Marine, St. Catharines, ON purchased the Senneville and her fleetmate Silver Isle from Pioneer Shipping for $5.7 million (CN) following the collapse of Great Lakes Bulk Carriers, Inc. and Misener Holdings Ltd. On June 1, 1994, the Senneville officially became part of the Algoma Central Marine fleet. 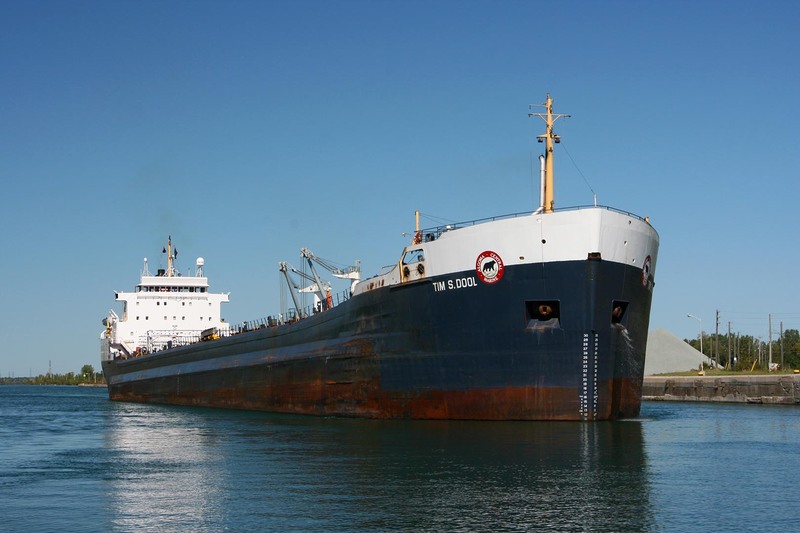 After repainting and being renamed Algoville, the bulker entered service for her new owners operated by Seaway Bulk Carriers, Winnipeg, MB (a partnership between Algoma Central and Upper Lakes Group). 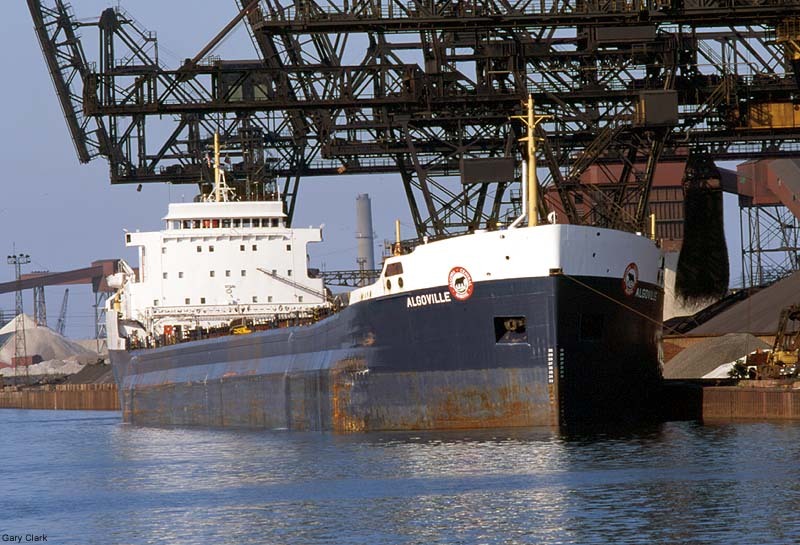 In January of 2000, the operation of the Algoville came under the new banner of Seaway Marine Transport, St. Catharines, ON following the amalgamation of Seaway Bulk Carries and Seaway Self Unloaders, St. Catharines, ON into one operating entity. The bulker's new name was simply a result of combining the corporate prefix "Algo" with the suffix of her previous name "ville". 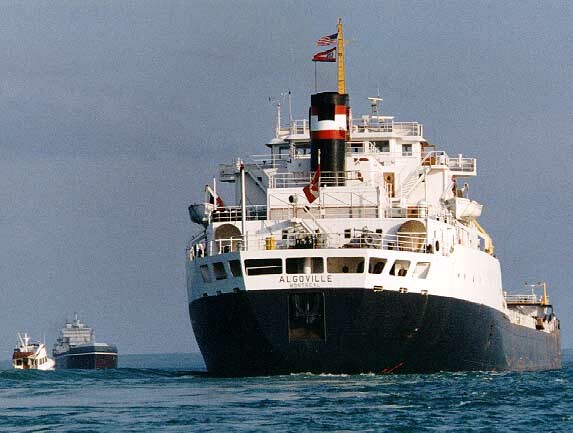 In October of 1996, the Algoville returned to service after having side tank and shell renewal as well as a widening of the hull by approximately 3' to the new Seaway dimensional allowance. The work was completed at Port Weller Dry Docks, St. Catharines, ON at an approximate cost of $6.4 million (CN). Her new mid-summer capacity increased to 31,250 tons at a draft of 28' 11" and 27,360 tons at the new Seaway draft of 26' 06"; the cargo being contained in 6 holds serviced by 18 hatches. Cubic hold capacities include 28,929 tons; 28,928 tons of wheat; 26,788 tons of corn or rye; 23,498 tons of barley; or 21,603 tons of oats. Operating capacities include 632.8 tons of fuel oil, 86.6 tons of diesel oil, 96.5 tons of potable water and 10,476.7 tons of water ballast. 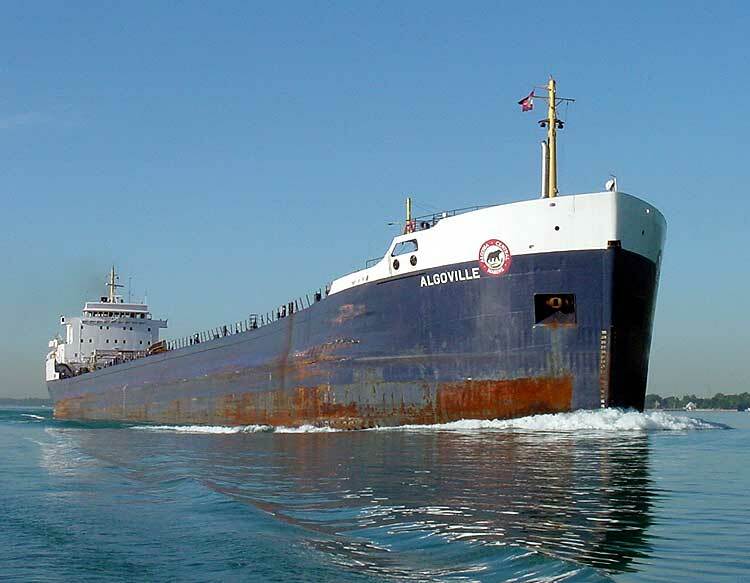 On May 1, 2006, the Algoville was towed to Goderich, ON by Malcolm Marine's tug Manitou after experiencing engine trouble while downbound in Lake Huron near Alpena, MI with 27,024 tons of wheat from Thunder Bay, ON for Quebec City, QC. After temporary repairs were made, she departed Goderich on May 13 only operating on 5 of her 6 cylinders. After unloading at Quebec City, the Algoville returned to Heddle Marine at Hamilton, ON (arriving May 23) pending the delivery and installation of a new engine. While laid up, on January 25, 2007, a fire broke out below decks as workers were cutting steel with a torch resulting in heavy smoke when some lubricant and oil caught fire. There were 12 workers on board at the time and 21 firefighters were required to extinguish the fire. No injuries were reported and there was no damage to the ship. The Algoville's new engine is a modern, efficient, medium speed MaK model 8M43C inline 8-cylinder 10,730 b.h.p. diesel engine built in 2007 by MaK, Rostock, Germany. The power is fed through a Jahnel-Kestermann reduction gear to a single controllable pitch propeller. The engine's basic dimensions are 32' 01.75" long x 9' 06" wide x 20' 02" high, with a dry weight of 112.2 tons. 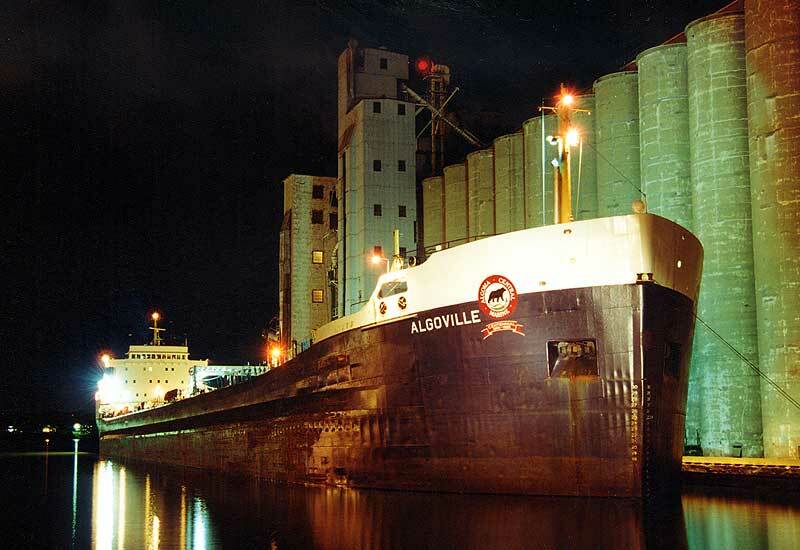 After successful sea trials, the Algoville returned to active service on Oct. 21, 2007 when the bulker departed Hamilton for Thunder Bay, ON and a load of Canadian wheat bound for Port Cartier, QC. Algoma Central Corporation renamed their bulker Tim S. Dool at a small ceremony held June 3, 2008 below Lock 1 of the Welland Canal. The renaming was in honor of the Corporation's former President and Chief Executive Officer on the occasion of his retirement from that position. Mr. Dool continues as a director of the company. The ceremony was attended by friends and family of Mr. Dool and employees from Algoma Central. Sponsor Mrs. Ellen Dool, wife of Tim Dool, rededicated the vessel with the traditional breaking of the champagne bottle against the laker's bow. 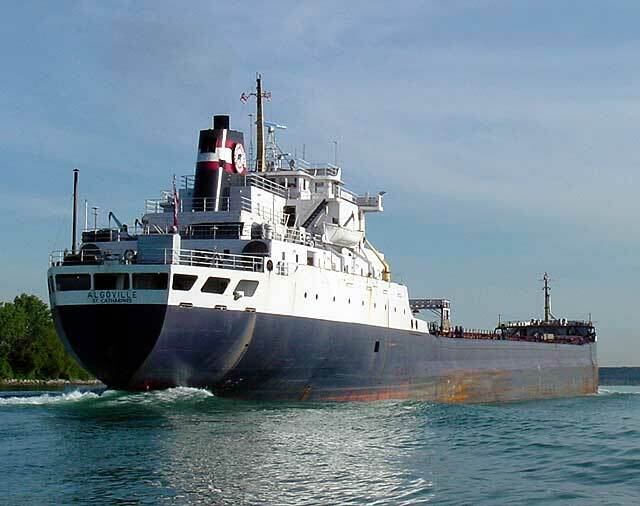 Seaway Marine Transport continues to operate and manage the Tim S. Dool for Algoma Central. 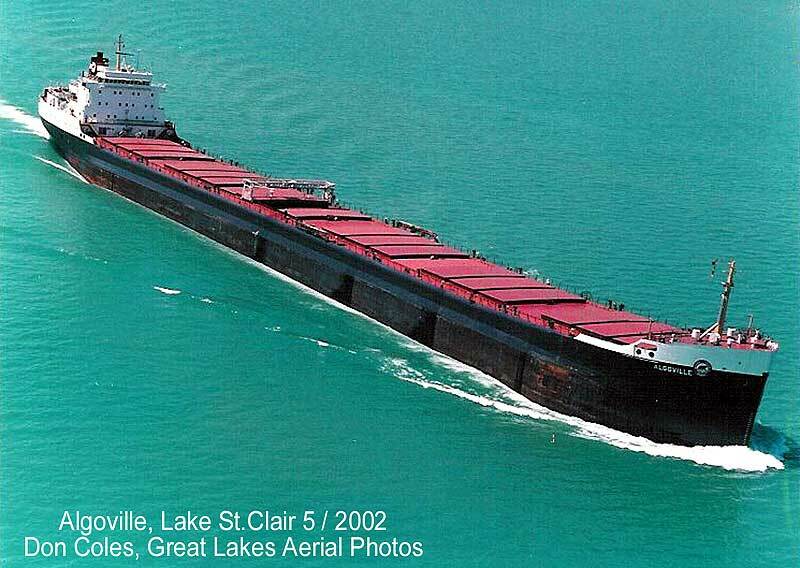 Her cargoes remain focused in the bulk agricultural and iron ore trades as they have since she first entered service on the Great Lakes. Unloading at Indiana Harbor, 1979. In balast for the next load. 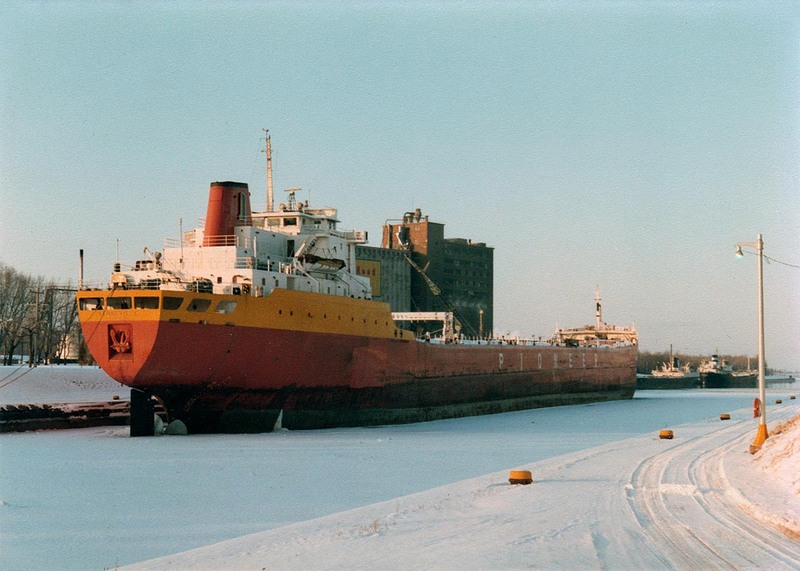 Laid up for the winter in Port Colborne, 1981. Passing Rock Island Light in the Seaway, Aug. 10, 1987. Unloading at Indiana Harbor, 1998. Entering the Iroquois Lock, St. Lawrence Seaway, May 22, 2000. Unloading at Indiana Harbor, 2000. Disabled, arriving at Goderich with tug assistance, May 1, 2006. Detroit River, Aug. 5, 2001. 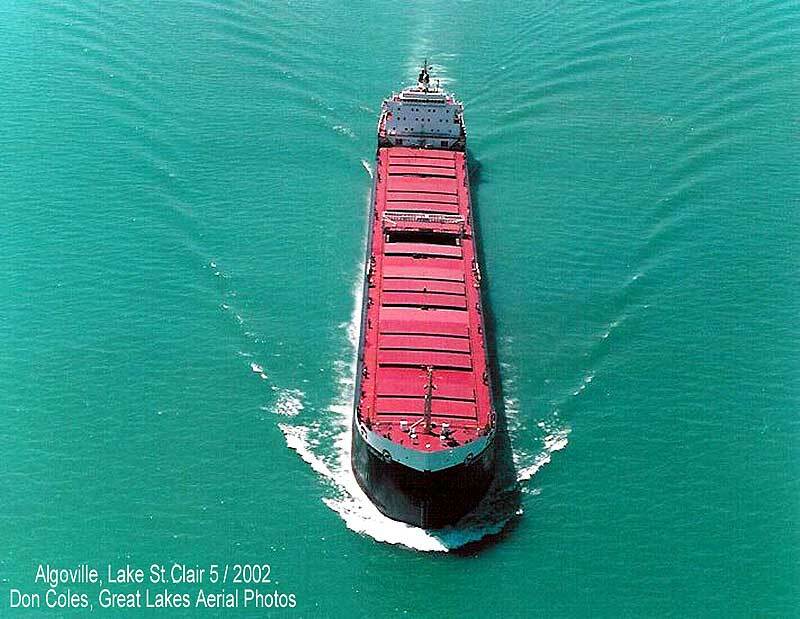 St. Clair River, Aug. 10, 2001. At Richardson's, Thunder Bay on Aug. 24, 2001. Detroit River, Nov. 16, 2001. Dry docking in Thunder Bay, Feb. 2002. In drydock at Thunder Bay. Downbound the Detroit River with the city of Detroit in the background, Aug. 29, 2002. Approaching Welland Canal's Lock 1, Nov. 17, 2002. Upbound the Welland Canal, Apr. 15, 2003. Heading under the bridges at the Soo, June 24, 2003. Detroit River, Sept. 14, 2003. At Pier 52, Toronto with a cargo of sugar during winter lay-up, Jan. 24, 2004. Upbound at the Soo, Mar. 29, 2004. Meeting the upbound salty Yarmouth above the Soo Locks, Apr. 17, 2004. On the St. Marys River at Mission Point, June 27, 2004. Detroit River, Sept. 19, 2004. St. Lawrence River, Dec. 2004. St. Clair River, July 23, 2005. St. Lawrence Seaway, July 31, 2005. Upbound the Welland Canal, Aug. 2, 2005. Downbound at the Soo, Apr. 29, 2006. Disabled, arriving at Goderich May 1, 2006. At Hamilton for engine replacement, Oct. 13, 2007. St. Lawrence River in the 1,000 Islands, Nov. 11, 2007. Upbound at Port Colborne, Dec. 1, 2007. Stern view, Dec. 1, 2007. Downbound at Port Colborne, Dec. 10, 2007. Leaving Welland Canal's Lock 4, May 24, 2008. Downbound the Welland Canal passing under the Glendale Ave. bridge, May 24, 2008. Scraping off the old name, June 2, 2008. Upbound the Welland Canal, June 3, 2008. Exiting Lock 7, June 3, 2008. Welland Canal, June 3, 2008. Entering the St. Clair River at Point Edward, June 11, 2008. Upbound the St. Lawrence River for Superior, Aug. 12, 2008. Upbound the St. Lawrence River entering the Brockville Narrows, Sept. 13, 2008. Approaching Lock 8 upbound, Sept. 19, 2009. Lining up to enter the Burlington Canal, Sept. 5, 2016. Clearing the piers into Lake Ontario. Upbound at Mission Pt., Mar. 25, 2017.